The Jets dominated the first half in pretty much every statistical category and, most importantly, on the scoreboard. New York blanked the Dolphins in the first two quarters and put up 10 points of their own on the strength of a WR Robby Anderson 69-yard touchdown catch from QB Josh McCown. The second half mirrored the first, as the Jets would add 10 more points thanks to a field goal and a RB Bilal Powell touchdown run. 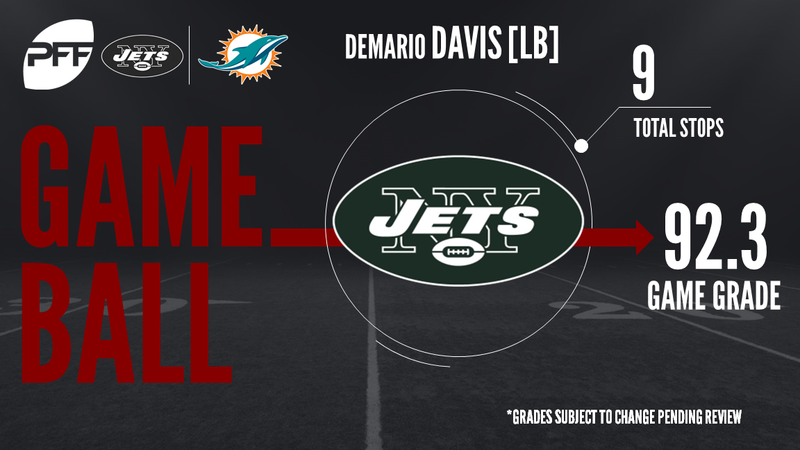 Despite a Devante Parker TD on the last play from scrimmage, the Jets cruised to a 20-6 victory. With that, we give you our PFF exclusive takeaways from the contest for each team. McCown had an incredibly accurate day. He went 18-of-23 with two dropped passes for an adjusted completion percentage of 87.0. He also did a great job of keeping the ball out of dangerous situations with no turnover-worthy throws. Going up against Cameron Wake is still one of the toughest tasks in the NFL and Shell found out first hand on Sunday. He allowed a sack and three hurries as well as numerous other poor blocks in the run game. Davis was everywhere for the Jets defense, racking up a ridiculous nine stops. He was key to stopping the Dolphins underneath passing game where seven of his stops occured. The rookie first-rounder continues to impress. Adams was targeted twice on the day and didn’t allow a single catch. He also added a pass breakup and a sack for good measure. Cutler couldn’t get anything going down the field today. On throws targeted 20-plus yards downfield he was only 1-of-8 for 26 yards. Once pressure got to him, Cutler crumbled as well. He was pressured on 17 dropbacks and went 4-of-13 for 26 yards on those plays. Thomas will have to add more in the receiving game for his sub-par run blocking to be able to see the field. He caught three passes on the day, but for only 16 yards and had a handful of play-ruining run blocks. The rookie was a consistent line of scrimmage mover in the run game. He only made one stop, but controlled nearly every interaction on run plays. It was a very rough day at the office for Verner who managed only five snaps on the day. Of those, only two were in coverage, and of those one was an ugly 69-yard touchdown.